This is a post prepared under a contract funded by the Centers for Disease Control and Prevention (CDC) and written on behalf of the Mom It Forward Influencer Network for use in CDC’s Be Antibiotics Aware educational effort. Opinions on this blog are my own and do not necessarily reflect the views of CDC. For our sponsored post policy, click here. Do you ever look back on different times in your life and immediately want to facepalm? Here’s one of those times for me: I remember back in college that whenever I had an annoying cold or bug of some kind, I’d immediately go to the student health center to get an appointment and pray that they’d give me antibiotics. In my mind, I was sick and antibiotics would help me to feel better. And—I’m very sad to say—a lot of times the doctor would give them to me. What I would give to go back in time and NOT get those antibiotics, because the research shows that antibiotic resistance (which occurs when bacteria develop the ability to defeat the drugs designed to kill them) is one of the most urgent threats to the public’s health. In fact, each year in the United States, at least 2 million people get infected with antibiotic-resistant bacteria. And, at least 23,000 people die as a result. You truly shouldn’t be taking antibiotics unless you really need them. Otherwise, you’re contributing to the whole antibiotic resistance problem. I mean, I don’t want to do that. I bet you don’t, either. That’s why we’ve partnered up with CDC’s #BeAntibioticsAware educational effort to help get the word out on appropriate and responsible antibiotic use. 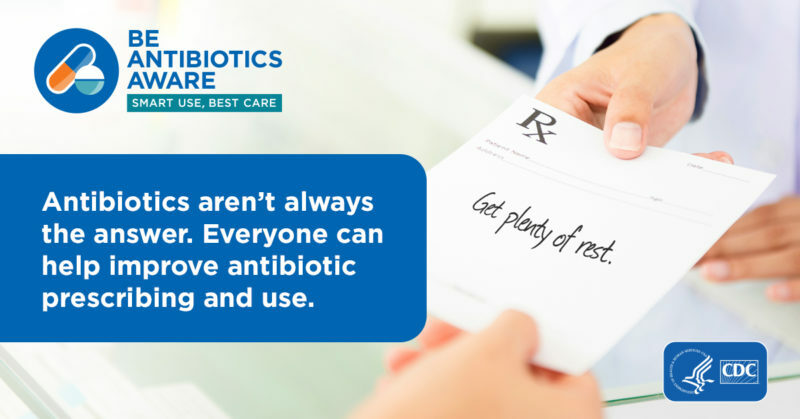 Antibiotics aren’t always the answer, and everyone can help improve antibiotic prescribing and use with the right info. Read on for what you need to know about antibiotics — for both yourself and your family. Antibiotics don’t work on viruses. Antibiotics only work on some bacteria. Antibiotics are only needed for treating certain infections caused by bacteria. 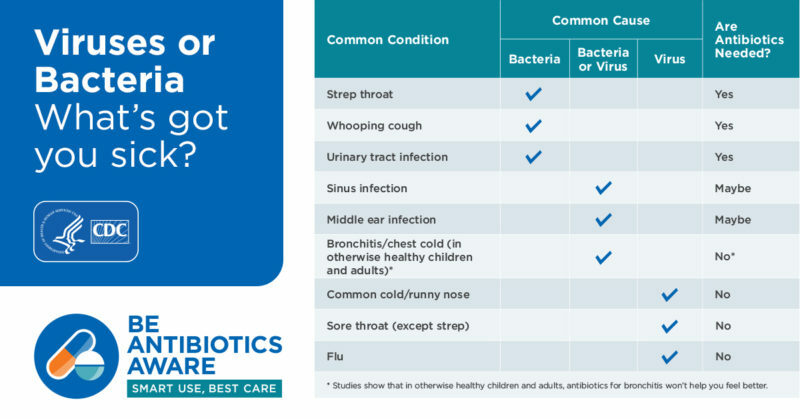 According to CDC, antibiotics aren’t needed for some common infections caused by bacteria, including many sinus infections and some ear infections. You should only use antibiotics as prescribed. If you need antibiotics, take them exactly as prescribed. Talk with your doctor if you have any questions about your antibiotics or if you develop any side effects, especially diarrhea, since that could be a C.difficile (C. diff) infection. Don’t get me wrong: Antibiotics are AMAZING.Antibiotics are critical tools for treating people with serious and life-threatening conditions like pneumonia and sepsis, the body’s extreme response to an infection. When a patient needs antibiotics, the benefits of the drug usually outweigh the risks of side effects or antibiotic resistance. Top priority is to stay healthy. Bottom line: We can make a difference together!